New Jersey has one of the most restrictive computer recycling regulations in the US. The NJ DEP along with 7 other State environmental regulatory agencies has classified to be disposed of computer equipment as a “Universal Waste” . Universal Waste is a Federal EPA managed and regulated set of waste disposal handling requirements. Under these handling guidelines only properly registered “Universal Waste Destination Facilities” are permitted to process (recycle) a universal waste. The NJ DEP identifies NJ based computer recycling destination facilities as Class D Universal Waste Consumer Electronics permitted facilities. Class D facilities are authorized to recycle computers as required under the 2011 enacted NJ E-waste law. We are one of only 12 Class D licensed facilities in the State of NJ. Only a NJ Class D licensed facility can issue a regulatory valid computer recycling environmental compliance certificate. Back Thru The Future® is a Federal and State registered “Universal Waste Consumer Electronics Destination Facility” (Permit No. CDG120002, EPA ID No. 000075416). Don’t be confused by businesses identifing themselves as NJ DEP registered computer recyclers. Universal waste regulations require anyone handling or storing more than 11000 pounds of universal waste must register with both the Federal EPA and NJ DEP as a “Large Quantity Universal Waste Handler” Handlers are specifically prohibited from processing (recycling) the stored material. These businesses are used computer resellers and can not issue a regulatory valid computer recycling certificate as required under the NJ e-waste law. We document each project with a report listing the manufacturer, model, type of equipment, weight and serial number of every item of equipment recycled. This EPA audit report provides a record supporting your compliance to the recycling regulations for every item of equipment disposed of. Keep in mind that without a detailed legally valid environmental compliance certificate and audit report you could be held financially responsible for any environmental clean up costs if a one of your disposed of computers is found in an illegal dump. This is a pretty remote risk but it has happened. Back Thru The Future®, as a licensed universal waste destination facility, provides both onsite and plant-based regulatory compliant hard drive shredding. We are NAID AAA certified as a secure plant based and mobile hard drive shredding operation. We were the first computer recycling business in the US to receive this certification and we are the only NJ Class D licensed computer recycling facility with this security certification. With having both the industry’s highest available environmental and data security credentials why would you risk doing business with anyone with less? 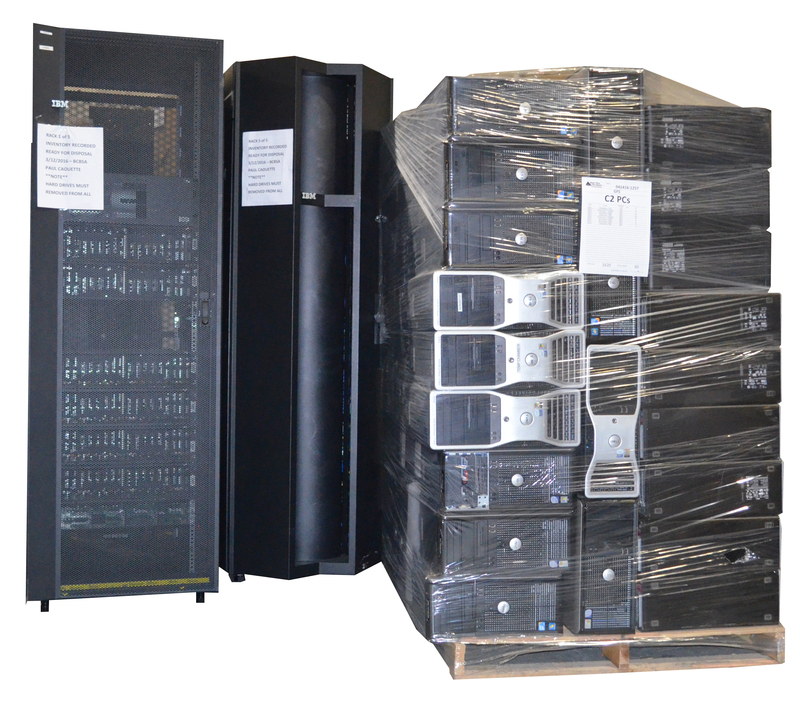 As a NJ based computer recycling company with over 25 years of experience and with our unique credentials as the only NJ DEP Class D licensed computer recycling company that is also a NAID AAA certified secure data destruction facility we have established ourselves as the preferred computer recycling company for NJ based businesses. We currently support nearly 70% of all NJ community banks and hospitals. Our customer list includes many major NJ centric organizations. We are the only NJ DEP Class D permitted facility that is also NAID AAA certified for both plant based and mobile hard drives shredding. We are certified by the SBA and NJ Economic Development Agency as a Small Business Enterprise. We are certified by WBENC as a “Woman’s Owned Business”. Over our 25+ years of experience as a computer recycling business, we have received numerous business awards for “entrepreneurial excellence” and have been featured in multiple business articles. We never resell hard drives. All hard drives are shred and the materials recycled within our highly efficient materials sorting systems. NAID AAA secure data destruction certification qualifies as “vendor due diligence” as required under data privacy regulations when you outsource the destruction of personally sensitive information. ISO standards require that all processes be documented and rigorous quality control standards be maintained. This includes not only internal processes but also requires us to monitor customer satisfaction. 100% of our customer surveys rate us “excellent” for project related communications. We will provide you with a written project quote within 24 hours of your request. We include a detailed statement of services to be performed. If the quoted costs and services to be performed meet with your approval you can simply give us your verbal approval to proceed. We then arrange a convenient pick up date and collect all necessary information concerning your pick up location. In the event of larger projects or challenging pick up locations, we will send a project manager to determine the resources necessary for the project. Our internal recycling process normally takes approximately 3 weeks. At the completion of your project, all project documentation is also uploaded to our web based document archive “Compliance Library™”. This archive represents a convenient location to retrieve all project related documentation and also represents a complete regulatory required document repository for audit inquiries.